This Blossoomer-related art trade I have done with my really good friend and fellow DeviantArtist, Kaitlyn aka KatyGorl, is dedicated to Ton aka swissnaturelover, Nathan Forester aka monstermaster13, and Jim aka canineart18 who celebrated their birthdays six days ago and Shinto aka ShintoIceCream who celebrated his birthday two days ago. So, Ton, Nathan, Jim, Shinto, I hope you gentlemen had a most blessed, awesome, grand, and uplifting birthday. Wie wir auf deutsch sagen, ich hoffe, dass ihr einen schönen, herrlichen, ausgezeichneten und tollen Geburtstag hattet. Comme on le dit en francais, j’espère vous avez une bonne, belle, excellente et merveilleuse anniversaire. I would also love to dedicate this to all of the awesome Blossoomer shippers out there. So, ladies and gentlemen, sit back, relax, and enjoy. As you all can see, we have a fine and happy Blossoomer family with twenty-six-year-old Boomer being the strong, buff, handsome, lovable dad that he is, seven-year-old Bloom being the jolly leader girl like her mother Blossom, and twenty-five-year-old Blossom being the nurturing, eloquent, courageous, and gorgeous mother that she is. With this recent art trade I have done with my dear friend Kaitlyn aka KatyGorl, my feelings for Blossoomer and for Butchubbles have grown from being cute, innocent pairings bordering on OTPs to fully-fledged OTPs totally standing on par with Blossutch and Boomubbles to the point where I ship all four of them as my OTPs aside from Brickercup. Yeah, I said it. My feelings for Blossoomer are just as strong as those I have for Blossutch and the same thing can be said about Butchubbles and Boomubbles. So, let’s see how Bloom, KatyGorl’s Blossoomer daughter, came to be. There was no doubt that Brick and Buttercup sealed the deal as being a strong item, which is the same thing that happened between Butch and Blossom as well as Boomer and Bubbles. However, there were certain things that were eating at the four of them, especially both Boomer and Blossom. For the longest time, Boomer had a huge crush on Blossom, even though he truly admired Bubbles body and soul. This was mostly because Blossom was extremely helpful in terms of his academics and she was the one who constantly pushed him to excel in everything he accomplished both as an integral member of a superhero team and in his academics to the point where he graduated high school with honors. He admired Blossom not just because of her beauty, but also her courage, strength as an independent young woman, her savviness, her grace, and how she will not take crap from anyone. However, Boomer could not pluck up the courage to tell her due to the fact that Blossom dated Brick, even though their relationship ended up going up in smoke before the eleventh grade, Butch was officially Blossom’s greater equal, and Boomer still had his long-lasting relationship with Bubbles. Blossom, on the other hand, admired Boomer from afar as long as she can remember. Yes, she was Boomer’s tutor in mathematics and the sciences, the very subjects he had difficulty in throughout their years of being in school. Everything about Boomer seemed to click exceptionally, even though he was in a relationship with Bubbles. His determination, lovability, attentiveness, complete athleticism thanks to his peerless combination of super strength and super speed, considerate nature, kindness, willingness to empathize and be true to himself, and charisma are the very qualities that have always made Boomer so admirable in Blossom’s eyes. She was indubitably over Brick and she was in a relationship with Butch, but something needed to be done. Everything came to a head when Boomer and Blossom finally confessed to their respective siblings a year before graduating High School. Boomer went out of his way to tell Butch how much he loved Blossom but was so jealous of both Brick and Butch for having their eyes set on her. Blossom was at first hesitant to tell Bubbles her true feelings for Boomer, for this will damage the Commander and Leader image she has always built up both privately and publically. Bubbles, being the emphatic listener, was calm throughout the whole affair, even when Blossom stated how much she has admired Boomer for everything he is and will always be. She even admitted straight up to Bubbles how utterly jealous she was when she ended up dating him, even after the debacle that went on with Brick. Butch and Bubbles took the revelations well and have firmly decided to switch life partners, which went on before their second year of college since Bubbles also admired Butch for how super strong, tough, and fierce he was and Butch admired Bubbles for how compassionate, patient, and utterly merciful she was. They then consummated their feelings, blissfully unaware of what was going to happen next. The two pairs stayed with their switched significant others which left Brick and Buttercup rather surprised, considering how stable their relationship has been. Even though the plan of switching life partners proved to have worked, there was one thing that was sort of a loophole in their plans. Five months before graduating High School, Blossom found out that she was pregnant with Boomer’s child. A week later, Bubbles also found out she was pregnant with Butch’s child. The plan truly backfired but Butch, Boomer, Blossom, and Bubbles knew that they will have to make it through the first few months of college with their heads up, in spite of the fact that Mr. Green, Mrs. Bellum-Green, Professor Utonium, and Mrs. Keane-Utonium were utterly shocked that the four of them would go through this type of scenario while being between the ages of seventeen and nineteen. The parental figures had good faith in their four respective children knowing that they can handle the responsibility. If they can handle saving Townsville 24/7, they will surely handle what adulthood is really like. At least, they were able to graduate High School exceptionally, with Blossom being the Class of 2011’s valedictorian alongside Brick and Butch, Boomer, and Bubbles graduating with honors. Come one ultrasound session before graduation, where Boomer, Blossom, Butch, Bubbles, Mr. Green, Professor Utonium, Mrs. Bellum-Green, and Mrs. Keane-Utonium found out that Blossom and Bubbles were going to give birth to girls. Throughout Blossom’s pregnancy, she always craved for yogurt, strawberries, blueberries, raspberries, cherries, fruit smoothies, fruit-based milkshakes, and fruit-flavored ice cream. Moreover, she felt chills and slight shocks in her womb, thus signaling that she was about to give birth to a cryokinesis user who also Boomer’s powers of creating objects out of raw energy. The day of delivery came on July 25, 2011, where Blossom gave birth to Bloom Amanda Green who was said to have smelled of frozen berries and edible flowers when she emerged and had the placenta removed from her. Moreover, she was a placid yet jolly baby when she emerged from her mother’s womb. 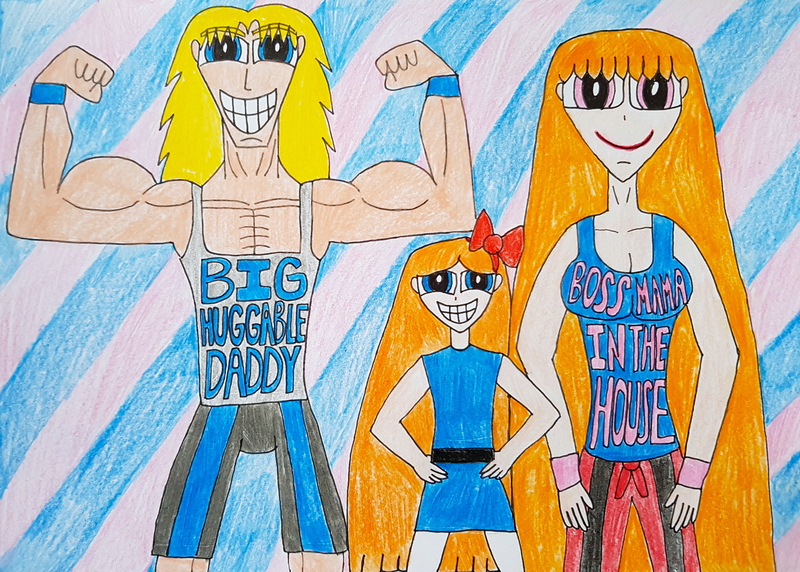 Because Blossom had to fulfill her duties as a college student Professor Utonium and Mrs. Keane-Utonium saw it fit to raise Bloom as her grandparents with Boomer and Blossom spending time with their beloved daughter every weekend and even while they were doing their assignments. The years rolled by and Bloom continued to grow with grace, amicability, beauty, intelligence, and love all thanks to being surrounded by her supportive grandparents, loving parents, and equally loving uncles and aunties. 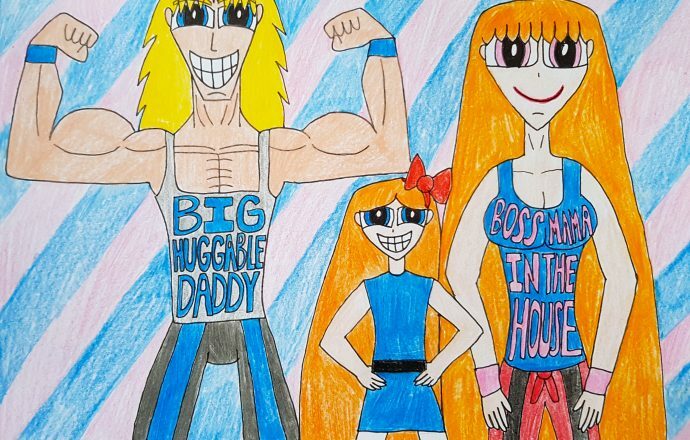 Even when Boomer ended up being reunited with Bubbles and Blossom ended up back in Butch’s arms, Bloom is still proud to call Boomer her dad and Blossom her mom. Moreover, with the half-siblings she had on Bubbles’ side in the forms of Bailey, Barley, Brittany, and Birdie and on Butch’s side in the forms of Brendan, Blake, and Belle, she and her cousin Brea, Butch’s and Bubbles’ daughter, were and will always be proud to call themselves big sisters, thus ensuring a loving relationship to flourish not only with them but also their cousins Blaze, Brent, Brooke, Ryan, and Pauline. Personality-wise, Bloom is the split image of her mother, as evidenced by her willingness to take charge, lead with dignity, pride, and ambition, and be the overall genius that she is. She also inherits some of Boomer’s traits, as in spacing out and daydreaming from time to time but also being sympathetic to those she meets on a daily basis, thus making her a rather well-rounded person in anything she does. In terms of her powers, she has her mother’s ice breath and her father’s ability to make objects out of raw energy. What is most interesting is how she is able to combine these two powers and form her icicle shock darts by forming electricity and embedding that raw energy in ice, thus having them thrown at her opponents to give them a freeze and an electric shock they will never forget. Combined with her special powers of ice powers and forming objects out of raw energy, Bloom is also an excellent tactician and is very pragmatic when it comes to attacking her enemies, thus making her leadership unquestioned and probably better than her own mother’s, since she is the overall eldest of the new generation of Team Xtreme superheroes. Outside the superhero work she does with her half-siblings, cousins, father, mother, step-father, step-mother, uncles, and aunties, she is an environmentalist who loves tending to nature, planting flowers, recycling, and even the more cultural activities like reading classic novels from authors like Bram Stoker, Jane Austen, Charlotte Bronte, C.S. Lewis, L. Frank Baum, Edgar Rice Burroughs, Franz Kafka, and many other influential others, listening to classical music, baroque music, chamber music, and opera, and speaking in different languages like Spanish, French, Cantonese, Mandarin, Italian, German, Japanese, and Welsh. So, there you have it. This is how Bloom came to be and this is who she is. So, Boomer, Blossom, Bloom, do you have anything to say to our beloved celebrants. Boomer, Blossom, and Bloom: Sure, we have. Boomer: Nous vous souhaitons tout notre amour et bonheur dans votre vies comme artistes et personnes. Blossom: We wish you all of our love and joy in your lives as artists and people. Bloom: Wir wünschen euch alle unsere Liebe und Glück in euren Leben als Künstler und Menschen. Mercí beaucoup, vielen Dank, and thanks so much. As for the rest of you, see you in the next submission.